V8, the popular juice that's been around for 75 years, is a tomato-based beverage filled with other nutritious vegetables like spinach, carrots and peppers. Aside from offering a generous serving of healthy veggies, original V8 and newer V8 beverages are also the base of several tasty mixed alcoholic beverages that make any party or gathering more enjoyable. The V8 Bloody Mary is easy to make, and is a perfect brunch drink or beverage for informal or formal dinners. To prepare the beverage, fill a cocktail shaker with ice, 2 oz. pepper-flavored vodka, and 4 oz. V8. Shake the ingredients vigorously for about 20 seconds, then pour into a highball glass that's been nearly filled with ice. To add more spice to the drink, add a slice of jalapeno pepper to the top of the beverage before serving. 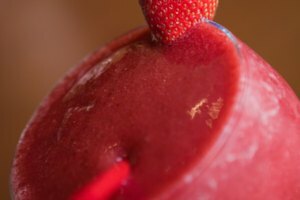 The Hoyt's Delight is a fruity beverage made with the Berry Blend or Fruit Medley variations of V8 Splash juice. The drink also includes Bicardi Razz, Bicardi Superior, Bicardi Big Apple, Southern Comfort, and lime juice. Use a double shot glass to mix the liquors and a splash of sweetened lime juice -- or fresh, if you want the drink to have a bit of zing. Fill a pint glass with the V8 fruit juice of your choice, and pour the contents of the double shot glass into the juice. Fruit garnishes like cherries or a pineapple wedge make the drink especially attractive and add another hint of sweetness. The V's With Sauce beverage is another savory drink that mixes V8 with vodka. Mix one part vodka of your choice with three parts V8; pour the juice into a highball glass, then add the vodka and stir. Add 2 tbsp. Worcesterchire sauce to the beverage and stir again. 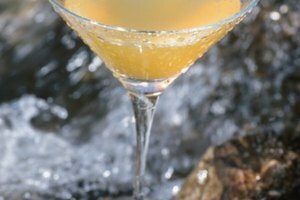 This drink makes for a quick-to-assemble, but impressive beverage for entertaining guests; garnish the drink pillar or glasses with celery stalks or tomato wedges to indicate the drink isn't sweet. 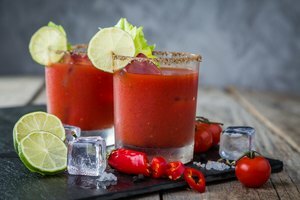 This Bloody Mary-type V8 beverage mixes savory and sweet flavors by combining the exotic flavor of coconut rum with the tomato and celery flavors of the vegetable juice. The drink requires half a shot of V8, one shot of coconut rum, and half a shot of your favorite vodka. 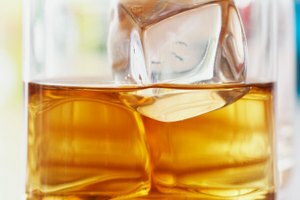 Place a few ice cubes in a highball glass to pour the beverage over, and stir the drink before serving it to guests. If you're presenting the drink to guests who prefer spicy flavor, add a few drops of hot sauce and stir to properly meld the flavors.